In the summer time, the grill is one of my favorite ways to prepare our dinner. Not only is it extremely tasty, in my opinion, but it is also nice not to heat up the kitchen when it is already hot outside. Sometimes though, having plain hamburgers and chicken can get boring. We try to mix it up, using different seasoning, barbecue sauce and marinades. This past weekend, thanks to Lawry's and MyBlogSpark, we had the chance to try some of Lawry's new marinade flavors. The one that we tried was the Tuscan Sun-Dried Tomato Marinade features extra virgin olive oil, sun-dried tomatoes, sweet red bell peppers and the perfect blend of herbs. I was very pleased with the flavor of the marinade. I added my chicken breasts and some of the marinade to a zippered bag. I let them set on the counter as I prepared my potatoes and started the grill. Then, when the grill was hot, I put them on the grill to cook. They marinaded for about 30 minutes, but the flavor definitely came through. My husband was pleased with it as well. I used the leftover grilled chicken (I had intentionally grilled extra) for our dinner the next night, which was Cajun Chicken Pasta. The flavors of the marinaded, grilled chicken added a nice additional flavor to the already flavorful meal. In addition, they have another new flavor - the Szechuan Sweet & Sour BBQ Marinade, which is supposed to give your meat a delicious sweet and sour flavor with a touch of Szechuan heat. I am intrigued by this one and hope to try it out soon. Visit www.lawrys.com to check-out the full line of Lawry’s products, additional grilling tips and to find delicious recipes for grilling season and beyond! 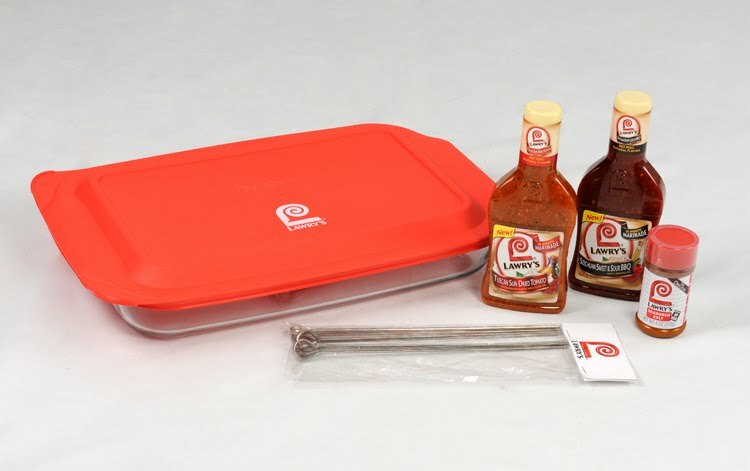 You can enter to win your own "Get Grilling Kit" courtesy of Lawry's and MyBlogSpark. To enter: Leave a comment sharing your best grilling tip and/or the flavors that you like to pair on the grill. · Follow this blog or sign up to receive e-mail updates (upper side bar). Leave a comment letting me know that you follow or subscribe (or if you already have been). · Include my button on your side bar or a link to A Busy Mom of Two in your blog roll. Leave a comment with a link to your site. · Share this giveaway with your friends on Facebook. · Write a post about this giveaway on your blog and leave a comment with a link to your post. Giveaway will remain open until July 20th at 6pm. Winner will be selected using Random.org random number generator. The winner will be contacted by e-mail (Please make sure that your email address is either in your comment or clearly visible on your profile or blog) and will have 48 hours to respond or a new winner may be selected. No compensation was received for this post. I did receive through MyBlogSpark and Lawry's my own "Get Grilling Kit", so the my family and I could experience the new marinades and share our experience. In addition, a kit was provided for a giveaway. I like to pair lime & cilantro - mmm! We like to use garlic and black pepper when seasoning meat on the grill. Toss veggies with a little bit of olive oil and minced garlic, then cook them on the grill in a metal basket while you're cooking your steak or burgers. Yummy! I'd like to try the Brown Sugar & Bourbon!!! I', a Southern Girl!!! I always make foil pouches full of veggies to grill. I LOVE the steak & chop marinade..it is soooo super yummy on steaks. I always put a slice of fresh food on top of the food while grilling. It gives it a much better taste! We're traditionalists. We usually use teriyaki or honey mustard on chicken. Although the pairing with mango is intriguing because I love me some mango salsa. I love to have zucchini from the grill lightly tossed in olive oil and salt/pepper! Yum! I love mixing basil, olive oil, salt and pepper, and a little balsamic vinegar. my grilling tip is to keep an eye on it LOL don't let it burn! Our friends made a great recipe with grilled peaches, almond and vanilla extract and a little brown sugar all a la mode!!! So my tip would be to make some grilled dessert!!! I like the flavor of mesquite chiken. Yum! My husband likes to marinate chicken in dijon mustard, vinegar and liquid smoke. I like Greek seasoning on skewered zucchini. But I must say, my hubby has spoiled me by putting bananas, brown sugar and butter in a pan and putting it on the grill when he finishes and comes back 20-30 minutes with a divine dessert. I like steak with teriyaki marinade. mmm. I'm not real experienced on the grill, but I'm working on it. I like to marinate veggies in italian dressing. Marinate meats for several hours before grilling them to absorb all the flavors of your seasonings and marinades. I love to add a dash of cayenne in with the seasoning in my burgers. It gives them an extra kick without overpowering them. It's a nice flavor. I like to use anything with garlic. YUM! Then I grill up some veggies with a bit of olive oil and garlic too.